One of Zoysia’s most attractive features is it’s resiliency to weeds. Unlike other grasses, Zoysia grows out along the ground. It sends out root stalks, or stolons, that create a thick carpet of grass in your yard. This is not only makes Zoysia lush and beautiful, but helps it to choke out most weeds. In the event that a weed does manage to grow, a few sprays from Weed Be Gone or a similar water soluble product will make quick work of the pesky plants. Make sure you don’t use Roundup, it’s designed to kill grass! Always read labels carefully before applying any product. If you start to have issues with crabgrass, your best bet is to use a pre-emergent to kill the crabgrass seed before it has a chance to germinate. Our Gluten–8 Organic Herbicide is a great product for this. For the best results, pre-emergence products should be used in early spring and again in the fall. You guessed it, Zoysia is very resilient to most lawn pests, with only a few exceptions. This lets you avoid the cost, time and risk of using pesticides. The few pests that can sometimes pester your Zoysia are grubs, mole crickets, cinch bugs and nematodes, especially when the plugs are still new. If you have a history of dealing with the mentioned pests, it would be a good idea to treat your lawn for them before planting plugs. If you have treat for them after your lawn has been planted, don’t worry, Zoysia isn’t bothered by the chemicals used. Amazoy will require up to 80% less irrigation than other types of grass, and will only need supplemental watering if there has been little rainfall. The best time to water your lawn is in the morning, preferably before noon. This allows the grass to dry before nightfall, reducing the risk of disease. A good way to test if your grass needs watering is to look at the surrounding soil. If it’s dry and cracking, it’s time to water your Zoysia grass. Be sure to avoid over watering, because excessive watering can damage the roots. If you have questions, check out our Moisture Meter to determine your lawn (or other plants) watering needs. Grass maintenance for Zoysia is pretty simple. 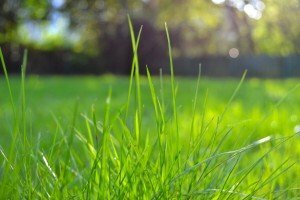 You will spend less time mowing your lawn (about two-thirds less time, to be exact) because Zoysia doesn’t grow tall as quickly as other grasses.